By representatives of all of the Jason-3 programme partners – EUMETSAT, the French Space Agency (CNES), the US’s National Oceanic and Atmospheric Administration (NOAA) and National Aeronautics and Space Administration (NASA) and the EU. Some slides from the event follow. Excerpt: "The Copernicus Marine Environment Monitoring Service (CMEMS) provides regular and systematic reference information on the physical state, variability and dynamics of the ocean and marine ecosystems for the global ocean and the European regional seas." The story began in 1995. 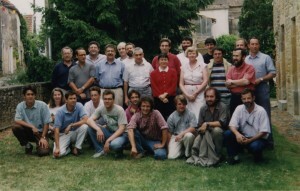 Some thirty scientists – oceanographers, meteorologists, mathematicians and engineers – met in a small village in the Périgord region.(...) “Mercator Project” was born, in tribute to the pioneering Flemish cartographer who created one of the first atlases and gave us one of the map projections most widely-used by oceanographers today. Mercator launches "MyOcean projects financed in large part from 2009 to 2015 by the 7th Framework Programme for Research, and then by the European Union’s Horizon 2020 programme". I am very happy and moved that my tweet was answered! Thank you very much Dr. Escudier! Merci! #askjason3 Why does the radar altimeter uses pulses at 13.6 GHz in the Ku band and 5.3 GHz in the C band to measure distance to sea?